Feathers do more than merely give your African Grey a pretty appearance. They insulate his body and give him the gift of flight. After about a year, though, his feathers wear out from normal use. Molting is Mother Nature's way of replacing his damaged and worn out feathers. Your African Grey's first baby molt will begin at about 8 months of age. His soft, downy feathers will seem to come out all at once -- don't worry, though. You may be vacuuming feathers up from all over your floor, but this is completely normal. At around 11 months of age your bird will begin his first true molt. He will first shed feathers from his outer wing, no more than one or two at a time. Whichever feather is released from one wing will also be released from the other within a day or two. This keeps your bird's body symmetrical and balanced so his flight won't be hindered. 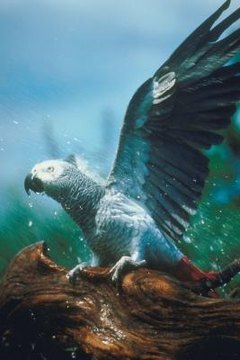 Following the outer wing feathers, your African Grey will lose his inner wing feathers, tail feathers and contour feathers, in that order. The contour feathers are the outermost ones on his body that give him his shape and beautiful coloring. The first molt takes the longest for him to complete and can last as long as two to three years. Once your African Grey has completed his baby molt, he replaces worn-out feathers every year or so. If he isn't still going through his baby molt, he will experience a second molt at about 18 months of age, during which all of his baby feathers should be replaced by adult feathers. You will be able to tell if your African Grey is growing his adult feathers by examining his tail. Baby tail feathers will be marked with a black, smudged or sooty-looking tip. A healthy bird will never shed more than one or two feathers at a time from each side of his body. Secondary molts will happen more quickly than your bird's initial molt, but it will still take several months for him to completely replace his feathers. Outside of your bird's normal molt, any sudden or unexplained loss of feathers should be discussed with your veterinarian. One of the most common causes of abnormal molt or abnormal feather formation is a diet lacking proper nutrients. The best prevention against such conditions is to feed your African Grey a quality, pelleted diet. You will know if your bird's diet is lacking if his new feathers have stress bars on them. These are areas where the feather hasn't formed during the growth stage, and will appear as dark spots against his normal coloring. Poor diet can also trigger poor quality feathers, poor coloring, and bands of differing color. The molt is an extremely stressful condition for your bird. As his body begins to generate new feathers, his metabolic rate will rise by as much as 30 percent. A quality, pelleted diet should give your bird all the nutrients his needs in order to sustain his body through the molting process. Keep your African Grey's toenails clipped. This will help keep him from damaging his delicate new feathers. He may also enjoy having his body misted with water more than usual. Don't be surprised if your bird becomes moody or is less active than usual. If you clip your African Grey's wing feathers to limit his flight, be extremely careful in doing so during the molt. The new feathers are alive when they first grow in, complete with a blood supply. While the feather is new, clipping it can cause great pain and profuse bleeding. Examine the base of each feather before trimming the wings, and do not trim them if any of the feather shafts, or quills, have a purplish-blue color.